Isn’t a phone just a phone anymore? The answer to this ridiculous rhetorical question is a big NO, phones haven’t been just phones for a very long time – this piece speaks to that truth. We can do countless things on our phones now that were not even possible 5 years ago – the rapid development of mobile technology has been breathtaking. For the audience of this blog, and the people they know, and the people that they know know, phones are ubiquitous. But to take it back to Paul Adams, the author we read last week, our phones are also a symbol of the inclusion/exclusion dynamic since our access to the phones separate us from those in the world who don’t have access to mobile technology. Phones definitely aren’t just phones anymore. They can also be tools for destruction, as the 2004 Madrid bombings demonstrate. That always seem to be the dynamic – great technological advancements that make our lives easier also carry the potential for great harm if it falls into the wrong hands. 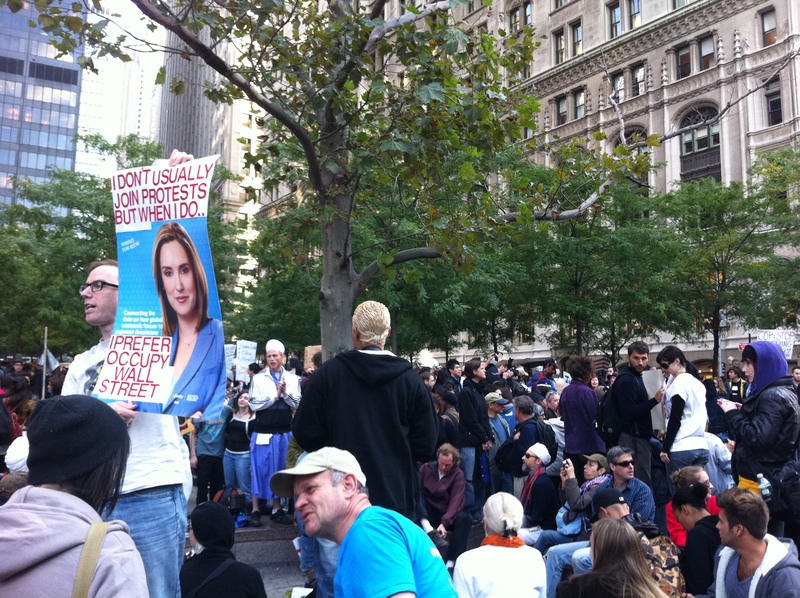 Of course I had to go to Occupy Wall Street! I took the above photo my phone. I did not venture into the park because I a little nervous (I also had no real desire to go into Zucotti Park). Nevertheless, from the perimeter of the park, I was able to see a rather larger group of protesters seated and listening to one another. Apparently, just from observing, I gathered that everybody had the right to speak before decisions were about activities for the day, even if it means that it takes them hours to make a very simple decision. Going into further detail about ideal speech situation, Adams explains that exclusion “interferes with the processes generating truth, sincerity, and justice.” I really saw this dynamic play out before me with the protesters. Who knows how much life is left in there movement, nevertheless, they are really trying to establish a open, democratic, culture which dovetails nicely with their claims of representing the 99%. Adams goes on to explore the inclusive/exclusive dynamic through a number of different prisms. In fact, one prism we can examine the inclusive/exclusive dynamic is given in the Lilie Chouliaki piece. What transnational media chooses to show or not show and how they show it separates people in many different ways. In the portrayal of suffering, the way the media presents the subject may determine how much various publics feel tied or identify with victims of some tragic event. The discussion we had in class a few days ago about networks was simultaneously amusing and informative. Before really getting into the readings, my notion of networks were limited to social media and “networking” in regards to one’s career. I remember hearing from career advisers “you must leverage your network” in order to have more success while looking for jobs. Those words didn’t give me much comfort years ago because I didn’t feel like my professional network was very large – I still don’t in fact. But maybe they were right after all; there were networks all around me that I perhaps had not considered. My notion of what a network could has definitely expanded this week; for example, the idea that online fan communities was a little eye-opening and not something I hadn’t considered before. One of the aspects of network theory that Paul Adams points out in his piece is the “self-organizing” nature of networks. The example of Glee was raised in class, but I must admit I don’t have to look too far back to my own younger days when being a fan of certain TV shows meant I was wasting time on the internet posting and reading through online forums (admittedly nerdy). The way these online fans can rally themselves to, for instance, protest the cancellation of a show they care about is a valid, albeit silly, example of network power. I think the role the internet plays in network formation is a fascinating topic. Surely, there were networks before the advent of the internet. According to Adams, “real-world networks are the outcome of spontaneous growth processes in which nodes and links are added at random (74).” When I first starting reading the passage where aforementioned quote came from, I wasn’t sure if the internet was part of what was being described given his choice of the worlds real-world.” Of course, I could see that it was as I read further. The belly of the beast! Anyway, that’s just a brief aside that neatly dovetails with our discussion about the global media system and media ownership this week! Coincidentally, I will be going the offices of one of world’s largest media conglomerations. Again, as some interested in media and communications, I have long been interested in the prospect of working at a place like TimeWarner. I work at small non-profit now, so the idea of working for a large corporation with offices all over the world is appealing to me. Funnily enough, the very things that I consider to potential benefits of working at TimeWarner are seen as nefarious symbols of too much ownership concentrated among too few. Robert McChesney really sounded the alarm about media ownership in his piece and I do see his point. In order to have a rich and dynamic public sphere, many voices have to be included and one should be vigilant that a corporations like TimeWarner doesn’t use its power to crowd others out. As a various consumer of media, I think it’s a privilege to live in the U.S. and feel like I have access to whatever kind of information I want, even if I have to spend a little more time to find it. Perhaps I would feel differently if I lived in another part of the world. The Thussu reading discusses how non-Western countries are concerned about media flows somehow interfering with their social/political affairs. If we want to get metaphorical, I suppose the U.S. and it’s media consumers are on high ground where they have the vantage point to survey other media flows? “To regulate, or to deregulate? That is the question….” I know….cheesy! But it does seems like the U.S. has some kind of existential crisis about the place of regulation in our economic affairs. Like Dr. Hayden mentioned in class, it is widely acknowledged that deregulation is one of the key factors in the near collapse of the financial system. Yet, it seems that now regulation is the dirty word…it’s curious. I think like most things, moderation is always a good rule of thumb. Sometimes, given that I don’t have a deep economic understanding of anything, I feel like I am just regurgitating Democratic talking points when I advocate for regulation. But it just seems to make common sense that you would at least have some. The various methods of regulation are broken down nicely in the piece by Siochru and Girard. I see the need for a little bit of industry and societal regulation. A little industry regulation is definitely needed to encourage plurality and diversity…both are needed in the interest of maintaining a robust public sphere. A little society is needed too….while I think the whole furor over Janet Jackson and Nipplegate was a little overwrought, there needs to be some policing a content. I wouldn’t advocate for the kind of societal regulation that makes the BBc possible, although I have nothing against the BBC…I think I prefer the model we have here with PBS. We were talking about symbols during the last half of class and it got me thinking. They were some good examples of symbols that we mentioned in class, and I wish I gave the example of Washington, D.C. Unfortunately, I didn’t think about it until I was out the door…my timing is impeccable. In any case, the architecture of Washington are symbols. From the streets being named after states, to the relative positions of the White House to the Capitol building, Washingtonians are awash in symbols. After living here in this city so long it is easy to forget or become oblivious. It really brings home the point that Dr. Hayden was making about the Carey reading: there is a lot more to communication than the ways in which we traditionally practice it (journalism, strategic communications, etc). The use of symbols as a mode of communication are more subtle but no less interesting.